When you think of salsa, what comes to mind? If the image you picture is simply opening a jar to pour into a bowl to serve with chips, think again! Traditional Mexican salsas are easy to make and go with so many different dishes. There are many Mexican salsa recipes out there, and each is different based on many factors like the region it’s from, the specific ingredients used and what type of food the salsa will be used with. Tomatoes, chiles, onions and garlic are the four main components to just about any authentic Mexican salsa (and in Mexico, salsa is served with almost every dish from eggs to soup to meat). Keep in mind that not all Mexican salsas tip the too-spicy-to-eat-scale simply because they include chiles! Fear not — it’s fun to try new foods! Tomate verdes, also known as tomatillos, are related to tomatoes and used very often in Mexican dishes. They are about the size of an apricot and grow inside a thin husk that you want to remove before eating. You shouldn’t have too much trouble finding them in markets and grocery stores in North America, and you’ve probably tasted them in the form of green salsas served in many Mexican restaurants. Cilantro is a bright green and very flavorful herb that looks like parsley. It is made up of the leaves and stem of the coriander plant (coriander seeds are often dried and ground or used whole for seasoning and have a different taste than cilantro). Cilantro has a strong and refreshing flavor and is used often in spicy dishes, especially in Mexican, Indian and Asian specialties. Chiles are another ingredient used in Mexican salsas, and there are many types (and their names change based on whether the chile is fresh or dried, and the region it’s from). The Serrano chile is one you might like to use when you make salsa since it is small, spicy and doesn’t need to be roasted or cored to use. You can simply dice and add them to your salsa. Serranos are much hotter than jalapeño chiles and are typically only a few inches long and about a half inch in diameter. Their color can be anywhere from a bright green to a darker green, to orange and yellow. The following recipes came from a beautiful cookbook, Mexico the Beautiful Cookbook with recipes by Susanna Palazuelos. It’s filled with wonderful recipes, photos and history. This is a classic condiment, served in most all Mexican restaurants. The ingredients of this salsa are finely chopped and not blended. Combine the tomatoes, onion, chiles, cilantro, salt and lime juice in a sauce dish. Stir well and season to taste. This is best prepared about an hour before serving it in order for the flavors to blend. This salsa has an earthy flavor and is considered an everyday salsa found across Mexico. In a saucepan, bring the water and 1 teaspoon of the salt to a boil. Add the garlic, chiles and tomatillos. Simmer, uncovered, for 8-10 minutes. Transfer the garlic, chiles, tomatillos and liquid to a blender. Add the cilantro and remaining salt and pepper and puree briefly. Transfer to a bowl. Stir in the onion and let the sauce cool before serving. It can be refrigerated for up to three days. Salsas are either fresh or cooked, but this version has a bit more intensity due to the fact that the chiles are roasted. This is perfect served with the popular snack foods sold on the street corners in Mexico. If you’re closer to home, these “snacks” are usually made of corn and turned into favorites like tacos, enchiladas, burritos and tamales. Use an iron skillet to roast the chiles and tomatoes for about 8 minutes, or until they are soft. Peel off and discard the burned skin from the tomatoes. Grind the chiles and garlic, either in a mortar or in a bowl using the back of a wooden spoon. When they are roughly chopped, add the tomatoes and continue to grind the ingredients. Add the salt. Serve in a small bowl. The salad is simple and a great side dish for any meal, particularly served with a mild fish. Ancho chiles are sweet but hot and are a dried version of poblano chiles, very popular in authentic Mexican cooking. Remove the seeds from the chiles. Cut them into slices about one inch wide. Rinse and then drain them. Combine the chiles, vinegar, oil, salt and pepper in a deep bowl. Stir and allow to stand for 24 hours. Stir the mixture and adjust the seasoning to taste. Arrange the lettuce leaves on salad plates, spoon the chile mixture on top and sprinkle with the crumbled cheese. Garnish with strips of jícama if you’d like. Salsa is simple to make and can be used to enhance so many different dishes. 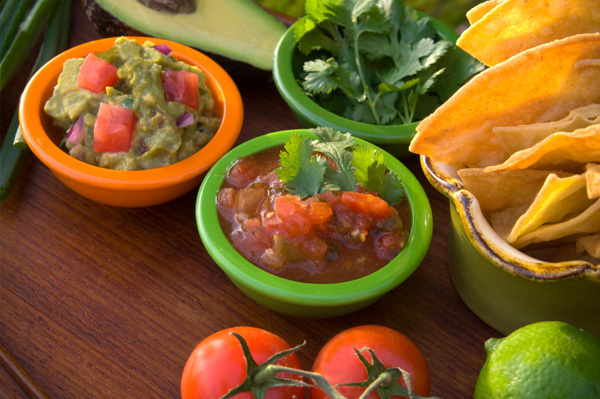 Give it a try and you might banish the jar of salsa from your household forever!